Scott J. White is an associate professor for National Security and director of External Academic Programs at Drexel University's College of Computing and Informatics. The views expressed are his own. At its core, terrorist violence challenges a state’s commitment and adherence to liberty and democracy, and the threats we face within our borders and beyond test the very underpinnings of our society. Canada faced just such a threat this week. 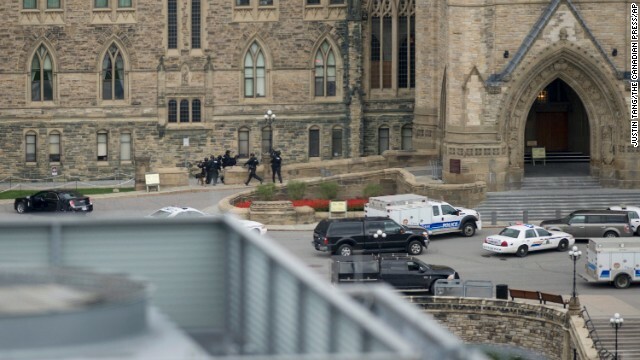 On October 22, Michael Zehaf-Bibeau is alleged to have engaged in an unspeakable act of wanton violence, reportedly walking up to a soldier guarding a memorial and shooting him, before opening fire inside the country’s parliament. GPS Digital Producer Jason Miks speaks with Zanny Minton Beddoes, economics editor for 'The Economist,' and Canadian member of parliament Chrystia Freeland about rising inequality – and how the West should respond. You were elected as a member of parliament in Canada last year. How do you think the big debate going on over inequality in the United States compares with how it is unfolding in Canada? Freeland: Basically, these are global phenomenon that are driving the surge in inequality. It’s globalization. It’s technological change. And there’s a political aspect, a set of political changes – deregulation, weakening of unions, privatization, changes in taxes. So this is really something that is happening in all of the Western industrialized countries, and also in a lot of the emerging markets – you see income inequality surging in China, Russia, India. So it’s a big issue in Canada. Interestingly, I think it’s becoming a truth universally acknowledged, which it wasn’t before the crisis. Things have changed. 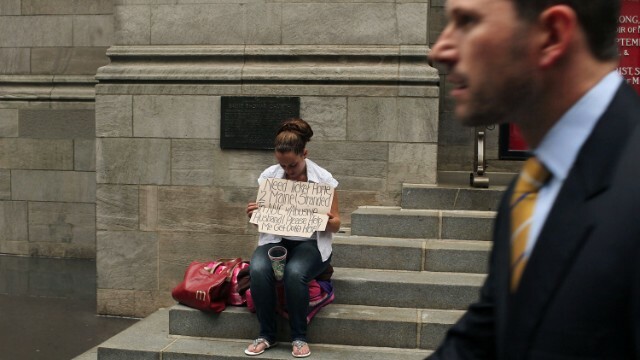 Income inequality is higher than it has been. So if you think back pre-2008, people were still debating that. Now, we all get that this is the new reality, and I think what you are starting to see is people focusing on what part of all this is bad, and what can we do about it. And I think the focus rightly is narrowing in on really the big problem of the hollowed out middle class, the stagnant middle class jobs and there not being enough middle class jobs. I think what you’re going to see increasingly is people saying that this is the thing we need to focus on, and also how do we improve social mobility? Take a listen to this rendition of the Beatles classic “Hey Jude.” Not the best you've ever heard of course, but perhaps the best by a world leader. That is Stephen Harper, prime minister of Canada, rocking out on the keyboard. Harper was serenading Israeli Prime Minister Benjamin Netanyahu during his visit to Israel last week and yes, that's Bibi singing along. If there's any doubt about the state of Israeli-Canadian friendship, yes, that is Harper singing "With a Little Help From My Friends." Editor’s note: Jonathan Kay is Comment Editor of the Toronto-based National Post newspaper. You can follow him @jonkay. The views expressed are his own. This is the fifth in the '14 in 2014' series, looking at what the year ahead holds for key countries. The biggest challenge facing Canada in 2014? It’s the same one that has threatened Canadian unity since the country’s genesis: the status of the majority-French province of Quebec within Canada’s majority-Anglo confederation. But due to a series of political gambits recently launched by Quebec separatists, this age-old issue now comes with a new and disturbing post-9/11 twist. American visitors to Montreal and Quebec City often come back describing the province as “European” in character. The term bespeaks praise for these cities’ cobblestoned historic areas, multilingual character, fine restaurants, and continental sophistication. But, less charmingly, Quebec politicians also are more “European” than the rest of North America in their suspicious attitude toward immigrants. And this fact is creating a growing cultural estrangement between Quebec and the rest of Canada, further exacerbating the country’s longstanding rift over language. 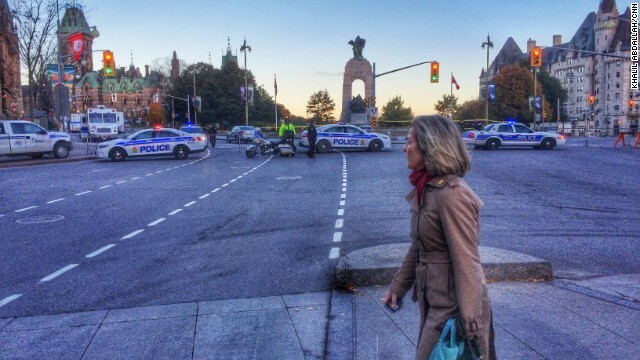 How big is Canada’s terrorism threat? Editor’s note: Veronica Kitchen is Associate Professor of Political Science at the University of Waterloo and the Balsillie School of International Affairs. The views expressed are her own. News that the Royal Canadian Mounted Police’s “Project Smooth” foiled an alleged terrorist plot in Canada was greeted in some quarters with the usual tongue-in-cheek surprise that violent extremists would target a “nice country” like Canada. But the fact is that Canada has long been concerned with its status as a potential terrorist target. Terrorism in Canada (and the United States) is a rare event. In the 1960s, the FLQ, a group of violent and revolutionary Québec separatists, launched a bombing campaign that culminated in the 1970 October Crisis, when they kidnapped and murdered the deputy premier of Québec, Pierre Laporte; Prime Minister Pierre Trudeau controversially enacted the War Measures Act and declared martial law. Canada’s most deadly terrorist attack came in 1985, when Sikh militants orchestrated the bombing of Air India flight 182, which exploded near Ireland killing all passengers, including 268 Canadians. Twenty-six Canadians were killed in the 9/11 terrorist attacks. More recently, it was revealed last month that two young Canadian men from London, Ontario travelled to Algeria and allegedly participated in a terrorist attack on a gas plant that resulted in the deaths of dozens of workers, as well as most of the terrorists. Soon after, it became clear that two others from the same high school were also suspected of involvement in terrorist activities. Coming from different ethnic backgrounds – and not all from Muslim or even particularly devout families – these young Canadians have forced us to confront our stereotypes about what a terrorist looks like. While Prime Minister Stephen Harper tried to score political points by arguing that Canada doesn’t spend time figuring out root causes, understanding domestic radicalization is imperative both to avoid attacks on Canadian soil and to help stop Canadian citizens travelling to other countries to participate in terrorism. (And indeed, as the journalist Paul Wells has pointed out, the Canadian government funds research into precisely that question). Canada’s response to terrorism has evolved with the terrorist threat. The response to the Air India attacks was generally considered to be poor, marred by a lack of co-operation between the Canadian Security Intelligence Service and the RCMP. Now, intelligence and law enforcement officials co-operate on national security matters under a strict set of guidelines through the Integrated National Security Enforcement Teams (INSETs) located in Vancouver, Alberta, Toronto, Ottawa, and Montreal. The Toronto and Montreal INSETs led the investigation in to the plot against VIA rail. Information is also shared beyond Canadian borders; in this case, the FBI was closely involved. Such co-operation can yield excellent results, as it appears to have this week. But we should also be conscious of cases such as that of Maher Arar, where information shared by the RCMP with American officials without the correct qualifications and restrictions led to the detention, rendition and torture of an innocent individual. This week, the Canadian House of Commons is debating Bill S7, the Combatting Terrorism Act, which would re-introduce controversial provisions allowing for preventive arrest and investigative hearings that expired in 2007. The Canadian Bar Association argues that such provisions duplicate existing laws; the charges in Montreal and Toronto this week would lend credence to that view. While Bill S7 has made its way rather slowly through the legislative process up to now, Harper’s Conservatives now have a majority. The bill is also likely to gain momentum from the arrests in Project Smooth. Indeed, some critics have suggested that the last-minute scheduling of the Combatting Terrorism bill debate is suspicious. Yet despite a few missteps, the Canadian government has largely avoided excess in its domestic governance of counter-terrorism, as befits the comparatively small magnitude of the terrorist threat relative to other public policy concerns. In some cases, Canada has been able to learn from American errors, for instance, in a more prudently designed no-fly list with clearer provisions for removing names. In others, Canada has bent too much to perceived American priorities. Delays in returning Abfousian Abdelrazik, a Canadian citizen, to Canada after charges of terrorism were dropped seem to be influenced at least in part by concerns about the American reaction. The reality is that terrorism policy in Canada is shaped by what happens in the United States. Our shared continent and the fact that threats can come from anywhere at home or abroad make this inevitable. As the rhetoric of terrorism inevitably ramps up in Canada and the United States in the wake of the Boston bombings and the VIA rail plot, we should avoid drifting back into the intense culture of fear and division that characterized the years after 9/11. While the Boston bombings show the impossibility of perfect security from attack, they also demonstrate the superior preparedness of our first responders. The Canadian arrests demonstrate that our security agencies have the tools they need to work together to investigate and charge violent extremist plotters. Trying Tsarnaev as an unlawful combatant or routinizing extraordinary measures such as those proposed in Bill S7 would be a step backwards. We can’t end terrorism, but we can address it without unduly changing the fabric of our societies. Editor’s note: Wesley Wark is a Canadian expert on security, intelligence and terrorism issues and visiting professor at the University of Ottawa’s Graduate School of Public and International Affairs. He served for two terms on the Canadian prime minister’s Advisory Council on National Security. The views expressed are his own. When it comes to terrorism, North America is a shared space. That has always been the conviction of Canadian officials and is written into our official counter-terrorism strategy. It is also a belief shared by much of Canadian society, though subject to a multitude of interpretations. Sometimes the reading of this shared political space is that terrorist events will occur in the United States, and Canada will feel the consequences in things such as tightened border security and more restrictive measures around travel to the U.S., or the movement of goods across our shared border. Since the 9/11 attacks Canadians have gotten used to girding themselves for something bad to happen in the aftermath of a terrorist outrage or foiled attack south of our border. We have also been keenly aware that a perception exists in some U.S. quarters that Canada is “soft” on terrorism. This has been an unhelpful slur. Canadian government and society at large are profoundly moved when tragedy strikes the United States, as was evident in their response to the tragic circumstances of the Boston marathon bombing last week. What they are relatively unused to is the notion that we might face our own serious terrorism threats. New citizens wave flags before being sworn in during a Naturalization Ceremony in October at the Statue of Liberty. Immigrants founded America hundreds of years ago, coming to the promised land in search of freedom and opportunity, in pursuit of the American dream. Today, many Americans see immigrants as a danger to that dream. They worry that immigrants are taking their jobs, using government services and changing the country's national identity. 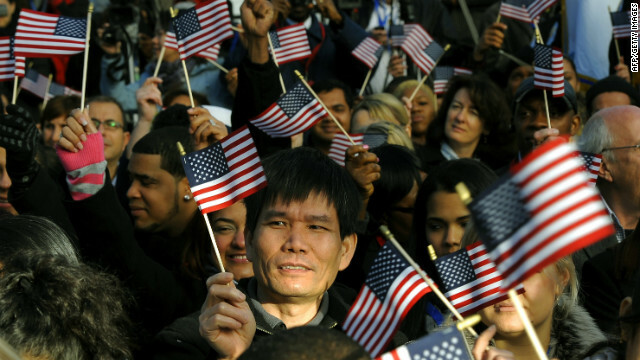 The average American believes that 39% of the U.S. population was born abroad. The real figure is 13%, still the highest level since 1920. Related: How much do you know about U.S. immigration? Immigration is divisive, a wedge issue in this election year. But most Americans (73%) agree that the government is doing a poor job of managing it.